Hillsboro starting pitcher Ryan Scott throws to Brennen Priest at first base for the putout on Saturday against the Wilmington Hurricane on Saturday at Paints Stadium in Chillicothe. Luke Magulac, the short stop for the Indians, fields a ground ball and prepares to throw to first base on Saturday against the Hurricane. 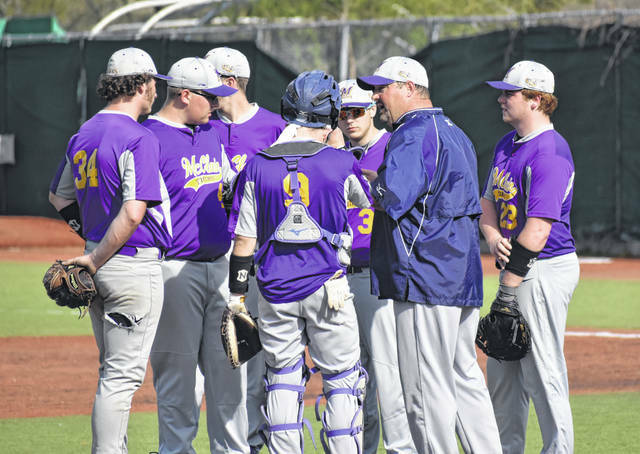 The McClain Tigers conference with starting pitcher Mason Ratcliff and Head Coach Rich Bunner on Saturday at Paints Stadium where the Tigers took on the Clinton-Massie Falcons. McClain senior John Salyers pitches in relief on Saturday against the Falcons at Paints Stadium in Chillicothe as part of the Little Hearts, Big Smiles Baseball Classic. 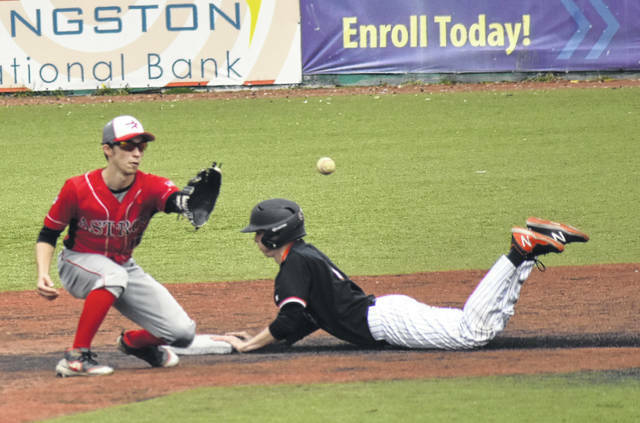 Whiteoak’s Traeten Hamilton slides into second base in the bottom of the seventh inning on Saturday at Paints Stadium in Chillicothe where the Wildcats took on the East Clinton. Zach Harless, of Whiteoak, records the game winning walk off single in the bottom of the seventh inning against the Astros on Saturday. 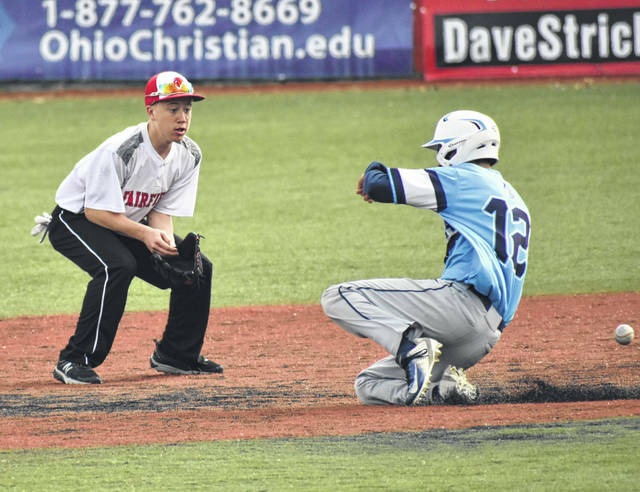 Fairfield’s Hunter Burns prepares to catch the ball on Saturday at Paints Stadium in Chillicothe while an Adena player slides into second base. Senior Sam Buddlemeyer makes an over the shoulder catch in centerfield on Saturday against the Adena Warriors in the first game of the Little Hearts, Big Smiles Baseball Classic at Paints Stadium in Chillicothe. CHILLICOTHE — The Hillsboro Indians hosted the Little Hearts, Big Smiles Baseball Classic on Saturday at Paints Stadium in Chillicothe where baseball fans were treated to a day full of baseball games that included the Fairfield Lions vs the Adena Warriors; the Whiteoak Wildcats vs the East Clinton Astros; the McClain Tigers vs the Clinton-Massie Falcons; and the Hillsboro Indians vs the Wilmington Hurricane. 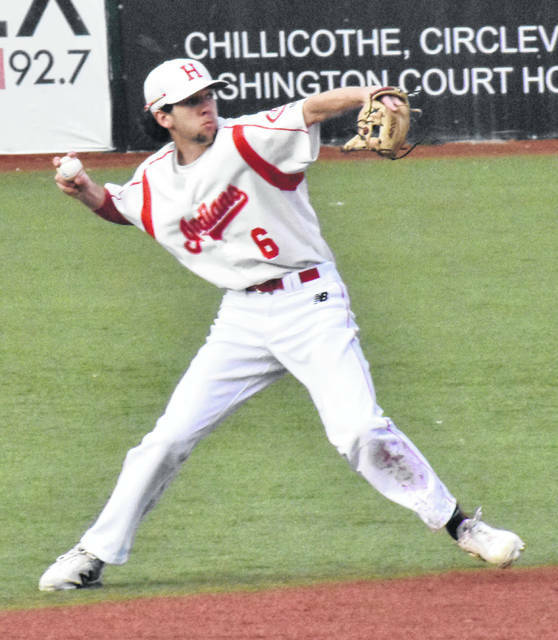 The host Hillsboro Indians played in the final game of the day at Paints Stadium and took on the Wilmington Hurricane, in a matchup of former South Central Ohio League foes, and used an RBI single by Grant Crum in the bottom of the eighth inning to come away with a 7-6 win. Alex Meyer was driven in on a single by Jake Vaughn in the top of the first inning to put the Hurricane up 1-0 early in the matchup. Singles by Meyer and Matt Spears got things started for Wilmington in the top of the third inning and Jordan Tackett drove them in with a line drive to left field for a single to make it 3-0. 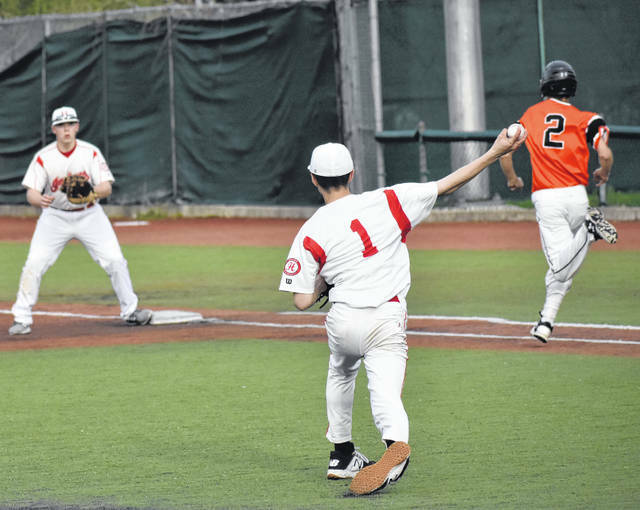 Vaughn Followed up with a single and Ben McAllister doubled on a hard ground ball to Hillsboro’s Ethan Humphries at third base that scored Vaughn to make it 4-0 with no outs in the top of the third inning. After getting the first out of the inning with a strikeout Hillsboro’s Ryan Scott walked Grant Pickard and then hit Jordan Macik that allows Vaughn to cross the plate and make it 5-0. A ground out by Ethan Henson to Crum at second base resulted in McAllister scoring before the putout to make it 6-0 after the top of the third inning. The Indians got things going in the bottom of the third when Brock Haines led off with a single to left field. Ethan Watson drew a walk after a fly out by Ethan Humphries and Crum singled to center field to load the bases with Jarrod Thompson stepping to the plate for the Indians. Thompson singled to short to drive in Haines and bring the score to 6-2 with the bases loaded and one out in the bottom of the third inning. Dylan Boone drew a walk that plated Watson and Scott doubled to drive in Crum but, Thompson was out advancing to home to make it 6-3 with two outs on the board. Boone and Scott both scored on an error by Wilmington’s Tackett at third base that allowed the Indians to climb to within one run at 6-5 after three innings. A double by Thompson in the bottom of the fifth inning drove in Crum and tied the game at six runs apiece after five innings of play. a scoreless sixth inning, seventh inning and top of the eighth inning set up the Indians to complete the comeback. A walk by Haines, single by Humphries and walk by Watcon set up Crum with the bases loaded and he delivered with an RBI single to centerfield that drove in Haines and brought the game to a close at 7-6 in favor of the Indians. The third game of the day at Paints Stadium saw the McClain Tigers battle the Clinton-Massie Falcons in a matchup of former SCOL rivals, the Tigers scored three runs in the top of the first inning and appeared to be well on their way to an eighth straight victory before the Falcons took control late for a convincing 12-4 win. 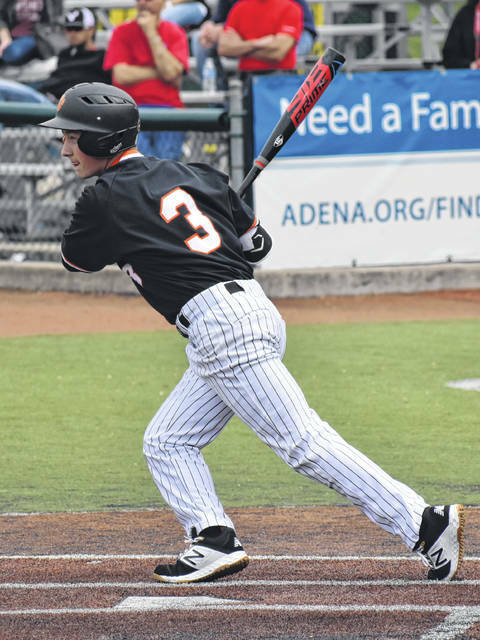 Eric Anderson and Colton Mossbarger got things started on the right foot for the Tigers with back to back singles to open the game and the Falcons intentionally walked John Salyers in the three hole to load the bases with Cody Pollock up next for the Tigers. Pollock reached on an error by the Clinton-Massie third baseman and Anderson scored on the play. Garrison Banks followed up with a line drive double to right field that scored Mossbarger and Salyers to make it 3-0 with no outs in the top of the first inning. A ground out by Sam Faulconer and a line out by Autsin Booth that resulted in an inning ending double play forced the Tigers to settle for a 3-0 lead as the teams prepared for the bottom half of the first inning. Bryan Kennedy drove in Luke Chappie with a line drive double to left field that provided for a 3-1 score after the first inning of play. A single by Spencer Branham with two outs drove in Seth Goodall and Kennedy scored on a fly ball by Dom Kerns that gave the Falcons a 4-3 lead after three innings of play. Massie added four runs in the bottom of the fifth and four in the bottom of the sixth inning when Goodall and Kennedy each scored twice for the Falcons and Corey May, Kody Zantene, Lewis and Branham each scored once to account for the final eight runs for the Falcons. Garrison Banks reached on an error and scored on an error in the top of the sixth inning to account for the Tigers’ final run of the game and provide the final score of 12-4. The Whiteoak Wildcats battled the East Clinton Astros in the second game of the day and used two runs in the bottom of the sixth and one in the bottom of the seventh inning to pull off the 6-5 come from behind victory. The Wildcats were able to strike first when a balk by Matthew Hall gave Mason Lehr a free pass and made it 1-0 in Whiteoak’s favor. The Wildcats added a second run in the bottom of the second inning when Chase Butler scored on a sacrifice fly ball by Zach Harless that made it 2-0 in favor of the boys from Mowrystown. The Astros found their groove offensively in the top of their third inning when Zach Mitchell led off with a ground ball single and Isaiah Curtis drove Mitchell in with a line drive to right field. Matt Hall followed up with a line drive single to center field that scored Curtis and tied that game at 2-2 with no outs in the third inning. Hall scored later in the inning to make it 3-2 in favor of the Astros when Cameron Vadnais singled to centerfield. Whiteoak was able to tie it up in the bottom of the third inning when Ty Large scored on a wild pitch and tied the game a three runs apiece. Both teams were held in check in the fourth and fifth innings and the scoreboard read 3-3 entering the top of the sixth inning. East Clinton added two run in the top of the sixth inning with Tristen Burkitt tripling to centerfield to score Curtis and Austin Arellano singled to center to plate Burkitt and push the Astros’ lead to 5-3. A triple by Evan Brill in the bottom of the sixth inning plated Harless and Lehr and tied the game at 5-5. 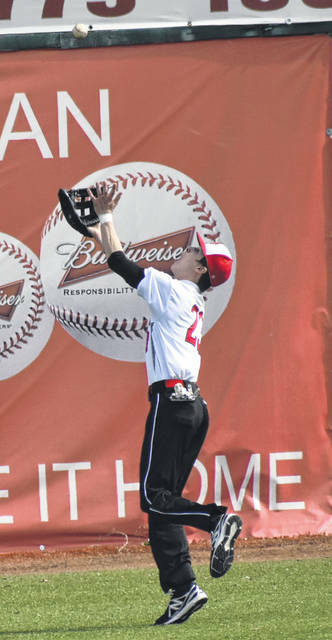 Harless ended the game with a walkoff single in the bottom of the seventh inning that scored Hamilton from third base after he reached on a controversial call at first base and then stole second and third base with two outs on board. The Fairfield Lions took on the Adena Warriors in the first game of the day at the Little Hearts, Big Smiles Classic but were unable to get much going offensively as they fell by a final score of 4-1. Adena struck first with a run in the bottom of the first inning courtesy od Roman Long who doubled on a fly ball to right field that plated Jarrett Garrison to make it 1-0. Long was put out trying to advance to third base on the play. In the bottom of the third inning the Warriors were back at it with Garrett Wilburn leading off the inning with a triple and then scoring on a single in the next at bat by Nate Throckmorton to make it 2-0. Lucas Foglesong singled to second to score Throckmorton and the Warriors held a 3-0 lead with no outs in the third inning. Long made it four to nothing with two outs in the third inning when he doubled to center field and plated Foglesong. Fairfield was able to score one run in the top of the seventh inning when Andrew Dingey hit into a fielder’s chioce that saw Jacob Morgan score the only run of the night for the Lions. Austin Setty pitched all six innings for the Lions and allowed nine hits, four earned runs and struck out three against the Warriors.